View of Lucy Dodd’s studio, July 2013. Lucy Dodd is an artist based in New York. 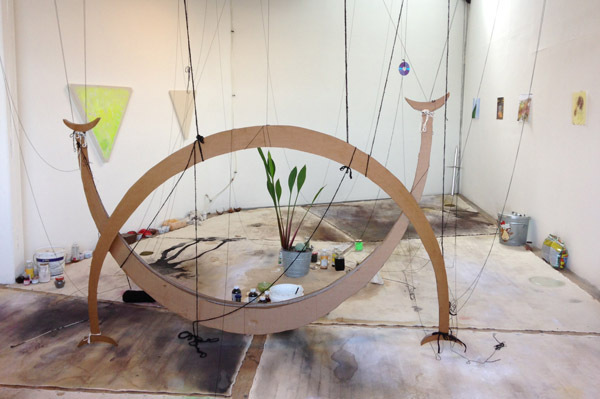 Her latest exhibition, “Foss,” opens at Blum & Poe in Los Angeles on July 20 and remains on view until August 31, 2013. Here Dodd discusses the origins of the eight new paintings on view in the show, as well as a tale she cowrote in 2004—a chief source of inspiration for this project. IN 2004, Jason Rhoades, Paul Theriault, and I began a project in LA called the Foss. It’s hard to explain how the project started or what it was because none of us knew at the time. Foss was the word to describe this dilemma and in the beginning it was also the acronym for our secret studio. But Foss became a word for many things, and it became many things, because all of us needed different things. Paul was the mastermind behind the Foss. His collages were brilliant and deserved a venue. These works inspired JRho. I had just finished my undergraduate degree at Art Center, and had no idea what I was in for. Things are not as they were in 2004. We bought CDs at Tower Records—we listened to Alicia Keys on repeat. I took strange adventures into empty buildings while location scouting for the Foss around LA. The weirdest was at 1100 Wilshire, an empty triangular skyscraper on the edge of downtown; Fear Factor once shot there. Paul wanted a gallery. Jason wanted a garden. We ended up working in a storefront. There were a lot of towels and hot glue involved, plus a huge copper tube with a crystal skirt, a floss container with the L scraped off, rolls of elastic, and precious stones, among other things. But it became too much and we closed shop. When the physical Foss was taken away, it was replaced by the characters of the fablethe catfish who wanted velvet whiskers, the butterfly who wanted to fly in the rain, and a dove with a broken wingas well as a water plant that was found in the trash and that managed to revive, which became the Foss plant. Some of this was eventually taken out to Wonder Valley, California, where it was left to bake in the sun and disintegrate into the Mojave Desert floor in a corral on Jason’s property. Jason described the Foss as a rebirth, and he ended up writing the fable. The Foss is my lost placenta, the perpetual generating force of the water plant, the cycles of my work. I don’t know if Paul ever believed in the Foss in the first place even though he was the one who made it all up. He moved to Chicago and started playing Ping-Pong with R. Kelly. I had no idea what the Foss was at the time, and they kept telling me, “The Foss is yours,” and I kept thinking, What the Foss is going on . . . ? With the vanishing Foss and Tide on my mind, I stretched and primed seven shaped canvases on the floor of my studio. Their sizes and shapes were determined by the studio’s unique architecture and by an equilateral triangle painting that holds them together as a unit. This painting is called the key; there are eight paintings, including the key. The lines of the floorboards determined the horizon lines on the wall. I kept going in and looking at them all stretched and taut and white and clean. They were the crispy ship sails you see on the horizon, but I had to take them through the storm. One day, I went into the studio and the first stain was there: my dog, Bubs, had peed. She had broken the seal for me, and with the odor remover Nature’s Miracle, I could begin again.